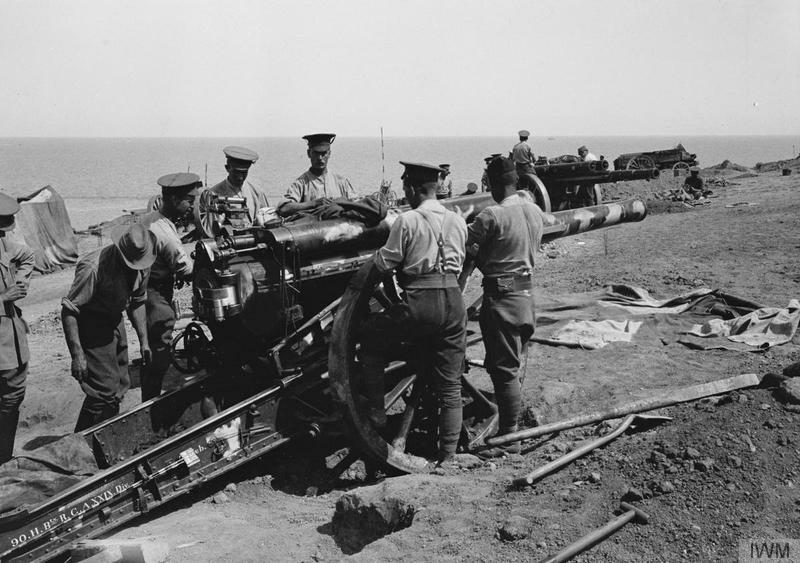 Two 60-pounder (5-inch) guns of 90th Heavy Battery, Royal Garrison Artillery (RGA) prepare for action at Cape Helles, Gallipoli. The gun in the foreground features rudimentary camouflage on its barrel and identification numbers on its carriage. The battery would later be posted to Egypt before being sent to the Western Front. This entry was posted in Events and tagged 1915, 90th Heavy Battery, First World War, First World War Centenary, Gallipoli, Royal Garrison Artillery, WW1. Bookmark the permalink. Hello, well. I think the bloke looking out at the camera might be my Grandfather! Sadly the dates you quote are not quite right for it to be him, but he told us stories of being at Gallipoli and he was in the GFA. ( #80434). Most importantly it looks just like him, I’m not sure how to post a photo of him here but I did today add one on the IWM site for remembered lives. That photo and the one above were around a year apart. I’m going to do some more investigation and will report back if I learn more.